Images speak louder than words on this one. 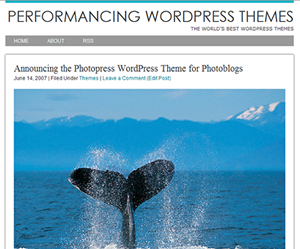 Performancing’s June Theme release is Photopress, a WordPress theme perfect for Photo blogs. Have you ever wanted to display your pictures in a photoblog without sidebar uglification? Well, that was the motivation behind Photopress; a one column WordPress theme specifically designed for photoblogs. With Photopress you can display large 640px width images without any clutter; perfect for the 640×480 landscape standard. If you want your photos to be front and center on your photo blog, with little interference from your WordPress theme, then Photopress is the theme for you. Photopress was designed by Brian Gardner. Click here to download the theme … or … Click here for a live preview of Photopress!. Update: Photopress has been updated for compatibility with WordPress 2.7 and up. Download the latest version here. I want to know how to widen the border that is wrapping around the photo so it can look more like the http://jeremygilliam.com that Neeraj provided? Any help would be appreciated. I want that border to be more wider. I’m with @yuri with this one. I think that this is such a great theme, but I’m a bit worried with the user interface. How does this theme go with widgets? Single-column photo themes like this are much too rare, unfortunately. The drop down menues from the top nav bar seem to not be working for me, anyone help with this? Can I customize a sidebar somehow? It’s an awesome design, but will it also support vidgets? Is this theme available or not? I agree with Thomas, we cannot view the themes! Leandra, we should have ‘rebooted’ the complete forum in the next days. Someone needs to moderate the Performancing support forum. It’s filled with disgusting spam.